It’s been almost a decade since the Amstel Quartet blew its first notes. Since then, the four young and enthusiastic saxophonists who make up the ensemble have built an international reputation in the world of chamber music, and beyond. 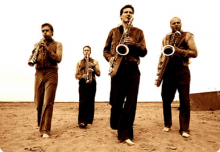 They met while touring with the Dutch National Youth Orchestra and in 1997 decided to form a quartet where they could test the boundaries of the conventional saxophone repertoire of the time. But first – what to call the quartet? The Amstel River is not only the historical birthplace of the city of Amsterdam, but also an ever-changing waterscape, reflecting the changes in life along its shores. For a quartet grounded in the traditions of chamber music, but ready to meet new and ever-changing creative challenges, the Amstel Saxophone Quartet was the obvious choice for a name. After a few years the name evolved even further, to today’s Amstel Quartet. With talent, creativity and a new name, the Quartet was on the road to success. When a member of the Amstel Quartet listens to music, he is always wondering: How can our saxophones transform this piece? Such was the case with the Arabian Waltz by Rabih Abou-Khalil, never before performed by a saxophone quartet. Adaptations and arrangements by members of the Amstel Quartet have won recognition and praise by many composers – György Ligeti, Philip Glass, Michael Nyman, Peteris Vask and Arvo Pärt to name but a few. And they’ve brought new life to old saxophone compositions, such as the infrequently performed Quartet by Tristan Keuris. Voor prijzen het inhuren van Amstel Quartet kunt u direct een offerte aanvragen. U kunt ook contact opnemen om de beschikbaarheid te checken of eventuele vragen te stellen.